Properly securing children into child car seats can be complicated. When in doubt, it’s best to check it out. If you have not had your car seat checked by a trained technician, there are generally a couple free car seat clinics each month. During your appointment, a technician will check your car seat’s safety, ensure it is properly installed, demonstrate how your child should be secured in the seat and send you on your way. 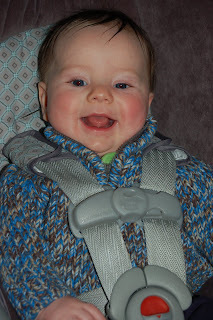 I have attended two car seat clinics -- once for his bucket seat and another when he went forward facing -- and gained useful information that improved my child’s safety both times. According to SGI’s web site, there are also a few certified child car seat technicians in Saskatoon and surrounding areas who are accepting appointments. Click here to find a technician near you. Additional car seat safety information is available from SGI, the Saskatchewan Prevention Institute and Transport Canada.